Very unusual forest-made chicken pizza-curry with veggies and mushrooms! Spicy, fresh and delicious! Beautiful fall scenery boosts this awesome pizza to another higher level! Simple and nourishing, professionally balanced to tinkle your senses with hot spice and calming it down with yogurt. Slice handful of mushrooms, 2 bell peppers and onion. Smash & chop 2-3 garlic cloves. Slice 300g of chicken breast. Mix step #1 and step #2 + cherry tomatoes in the bowl, add 1tsp. 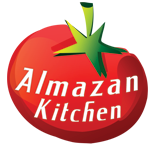 of Almazan spice mix, mix again. Fry everything for 7-15 min, when almost ready melt 1tbsp. of butter and add 1tsp. fish sauce mixed with water. Chop handful of dill and mix it with Greek yogurt. Spread everything onto the forest-baked bread, finish off with yogurt with dill and some chili peppers to taste.